Pumpkin Spice up your life: How much is too much? Trampled leaves cover the walkways, heating has finally kicked on in our residence halls and we’ve officially lost an hour of sunlight, but don’t break out the Christmas decorations yet—Pumpkin Spice Season is still upon us. Expanding in duration year after year, from late summer to early spring, the inherently fall flavoring dominates the market in cafés, coffee shops and stores as companies eagerly attempt to cater to the ever-increasing demand. The Pumpkin Spice trend may be attributed to Starbucks, after debuting their Pumpkin Spice Latte in 2003, but what has ultimately contributed to the current state of our “PSL Season” is commercialism. Companies and brands have latched on to the lucrative fad, producing more and more Pumpkin Spice flavored/scented products to exceed consumer demands. While some consider their PSL a quintessential fall beverage, it is reasonable to wonder how much Pumpkin Spice is too much? 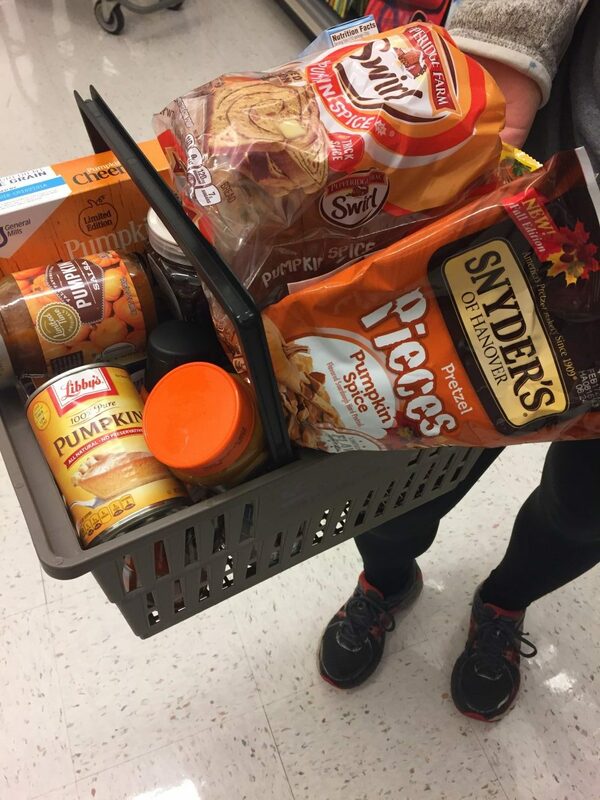 After surveying the local Stop and Shop, your inner white girl would be pleased to know that a majority of everyday consumer products are also made available in a seasonal Pumpkin Spice flavor. Oddly enough, these products range from lip balm to salsa and virtually everything in between. Exclusively sold in autumn, true fanatics may enjoy Pumpkin Spice: coffee, tea, creamer, morsels, cookies, Oreos, cookie spread, cake mix, muffin mix, ice cream, yogurt, bread, bagels, pretzels, cereal, odor absorbing scented beads, air freshener, candles, body wash and more. Unfortunately, the fall products do not stop there. Online research revealed there are countless items seasonally stocked on shelves that are apparently in exceedingly high demand. Some of the less anticipated items include, but are not limited to, protein powder, dog treats and even vodka. Nothing says “white girl wasted” quite like Pumpkin Spice shots. Pumpkin Spice Ice Cream: This product was actually really amazing and tasted like pumpkin pie. The cinnamon-y frozen dessert is probably the only decent Pumpkin Spice product other than a PSL or pumpkin pie itself. For this it receives 5/5 pumpkins for originality, taste and aesthetic. Pumpkin Spice Lip Balm: I’m not sure if lip balm is considered scented or flavored, but Pumpkin Spice surprisingly makes for an interesting chapstick. Essentially it reminds me of fall, and what’s more fall than reapplying lip balm every two seconds to combat severely chapped lips? Because this has no taste and is basically just a smell, I’m giving it a rating of 4/5 pumpkins for nostalgia and lip protection. Pumpkin Spice Bagels: You’re probably thinking “cinnamon raisin bagels are good, and Pumpkin Spice has loads of cinnamon, so therefore Pumpkin Spice bagels must be similarly good, or maybe, “I like pumpkin bread, so I must like the bagels.” But Pumpkin Spice doesn’t respect logic—in fact, it defies it. This was a gross experience and I feel like I just licked the inside of a pumpkin that’s been rotting inside a Dunkin Donuts since Halloween. This product receives 1/5 pumpkins for deception, flawed logic and triggering memories of when I was a barista. Pumpkin Spice Salsa: There is a special place in hell for whoever thought this would be a good idea. What’s next, Pumpkin Spice Guac? This is an absolute abomination and if anyone would like to buy an opened jar of this sweet tomato sludge please let me know. Congratulations, gentrification has officially reached salsa in Trump’s America. This product receives -10/5 pumpkins for texture, composition, taste and overall disgustingness. With all of these products following the basic economic model of supply and demand, it is easy to wonder who is doing the demanding? Certainly there cannot be thousands of people willingly spending money on Pumpkin Spice salsa. So how much Pumpkin Spice is too much? Where do we draw the line?